Remington EP7010 Corded Epilator. To help you to achieve a smooth and hair-free appearance, Remington has developed the EP7010 Smooth and Silky Corded Epilator. It removes hair swiftly and easily from legs and arms and more delicate areas like the underarms. Remington MPT4000 Perfect Brow Kit. Featuring a flexing dual blade that allows for complete precision with every stroke, it carefully follows the contours of the face for a close and accurate trim. Eyebrow comb with two length settings. Removes even the shortest (0.5mm) hairs. wet/dry for use in bath. Advanced Tweezers technology grabs hair gently, quickly and efficiently to give outstanding hair-free results leaving the skin silky and smooth. Corded Use Only. Cleaning brush. Precision light to see every hair. The Smooth & Silky Ultimate Cordless Wet/Dry Epilator removes up to 60% more hair in one pass . Australian Power Plug @ 240V. This is in immaculate, as new condition because the lady it was bought for only used it once. 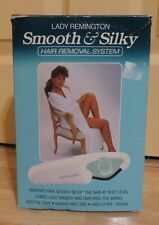 LADY REMINGTON SMOOTH AND SILKY HAIR REMOVAL SYSTEM - AS EFFECTIVE AS WAXING. Revolutionary hair removal system, an alternative to waxing Also suitable for bikini area and forearms. Removes hair quickly. Remington EP7010 Epilator. Simple and effective, this compact Epilator gives a premium performance at a purse pleasing price. Non-slip tweezer technology - 40 tweezers. Up to 4 weeks hair free. Removes even the shortest hairs (0.5mm). Your Remington epilator has been designed to make the removal of unwanted hairs as efficient, gentle and easy as possible – even those stubborn little strays. Its rotating tweezer feature tackles even the shortest and finest hairs and pulls them out by the root. Washable head Simple and effective, this compact epilator gives a premium performance at a purse pleasing price. Miss Always Prepared For super silky hair-free skin look no further than our Smooth & Silky range of epilators - the most advanced and effective epilation tools from Remington. Remington EP7020 4 in 1 Dry Epilator - Purple. Remington bodycurve epilator. In excellent condition. 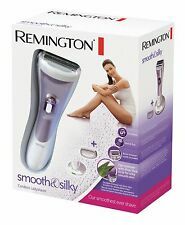 Remington Smooth & Silky Epilator/Shaver. Condition is New. Dispatched with Royal Mail Signed For® 2nd Class. 4 IN 1 EPILATOR EP7020. 1 x EP7020 4-in-1 Epilator. Shaver Head. HIGH PERFORMANCE EPILATION. Removes even the shortest hairs (0.5mm). Massage cap with Aloe Vera and in-built light for easy use. Precision light to see every hair. The Beauty of the Remington Epilator Hair. No girl wants to be caught short with hairy legs or unsightly underarm hair – no matter how many celebs have attempted to make such grooming faux pas acceptable. The Remington IPL6250 with ProPulse ™ technology can give you the effect of long-lasting smooth skin after only three applications. The ProPulse ™ technology, used only in Remington products, allows the painless removal of hairs. It removes even the shortest hairs, leaving your skin silky smooth. Facial epilator for use on chin, upper lip, forehead & to maintain eyebrows. 6x more effective than manual cleansing, with the facial cleansing brush. The Remington EP7020 Smooth and Silky 4 in 1 Epilator has been designed to make the removal of unwanted hairs as efficient, gentle and easy as possible – even those stubborn little strays! Its rotating tweezer tackles even the shortest and finest hairs from 0.5 mm and pulls them out by the root. 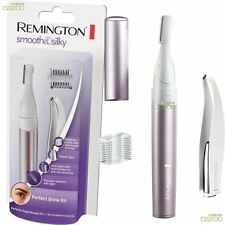 Remington EP7010 Washable Head Corded Smooth & Silky 40 Tweezers Epilator. Remington EP7010 Epilator. Simple and effective, this compact Epilator gives a premium performance at a purse pleasing price. Remington EP7010C Ladies Epilator 40 Tweezer H. Your Remington epilator has been designed to make the removal of unwanted hairs as efficient, gentle and easy as possible – even those stubborn little strays. To help you to achieve a smooth and hair-free appearance, Remington has developed the EP7010 Smooth and Silky Corded Epilator. It removes hair swiftly and easily from legs and arms and more delicate areas like the underarms. Do you dream of a delicate and smooth skin regardless of the season?. The epilator has also been clinically tested and approved by the FDA. The device is equipped with ProPulse ™ technology dedicated only to Remington products. Wet and dry use. The possibility of washing under water: No. With Light Hair! To help you to achieve a perfectly smooth and hair-free appearance, Remington has developed the EP7010 Smooth and Silky Corded Epilator. It removes hair swiftly and easily from legs and arms and more delicate areas like the underarms. Remington WDF4840 Cordless Lady Shaver - Silver/Violet. 1 x WDF4840 lady shave. Model Number WDF4840. Double foil shaver for comfortable and quick shaving results. 1 x Bikini trim comb guard. Cordless with charging stand. Simple and effective, this compact Epilator gives a premium performance at a purse pleasing price. Non-slip tweezer technology - 40 tweezers. Up to 4 weeks hair free. Removes even the shortest hairs (0.5mm). 1 x EP7010 Corded Epilator. Your Remington epilator has been designed to make the removal of unwanted hairs as efficient, gentle and easy as possible – even those stubborn little strays. Its rotating tweezer feature tackles even the shortest and finest hairs and pulls them out by the root. To help you to achieve a perfectly smooth and hair-free appearance, Remington has developed the EP7010 Smooth and Silky Corded Epilator. It removes hair swiftly and easily from legs and arms and more delicate areas like the underarms. The Remington EP7020 Smooth and Silky 4 in 1 Epilator has two speed options, allowing you to choose at which speed you’d like to epilate. The faster speed is great for larger areas like legs and when you want to be more careful like when epilating under the arms, use the slower speed.